Today I have spent my time loading a complex and beautiful quilt onto my long arm. It has taken hours listening to the quilt, telling me how it wants to be quilted. Oh sure, I hear your laughter, you are thinking Kelly is a bit crazy. But seriously, if you look at a quilt for a bit, you can sense what it needs for quilting. I have never been one to over quilt, I like a nice suptle feel to my quilt, so this has been a difficult decision. 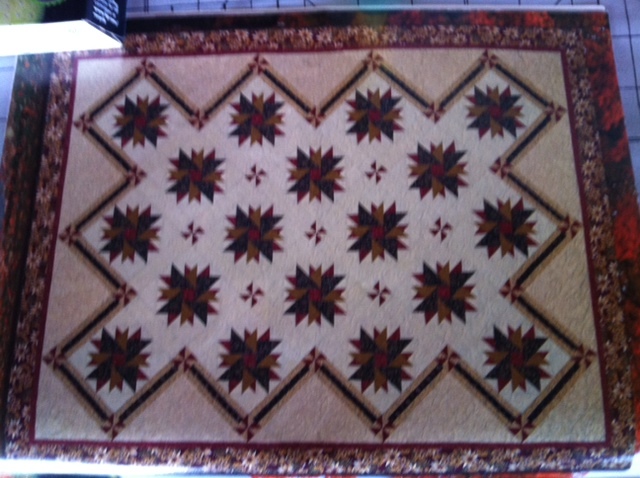 The quilt is called manchester mansion, it was a pattern put out in 2005 in quilt designers magazine. Do you have a quilt that you took your time listening to before you quilted it? If you do, please post a photo, I’d love to see it. thanks, i have some fun posts coming. creating your blog is fairly simple, you can go to godaddy.com or google blogspot. the instructions are pretty complete and easy to follow. I usually write for two or three hours a night for posts. other than that, pretty fun. hope that helps. Student of the Week How can I attach a picture in a comment?